It’s CHRISTmas! Christmas is about the birth of our Lord and Savior, Jesus Christ! Unfortunately, the reason for the season can get buried amidst the bustle of shopping, hanging the lights, and listening to the ho-ho-ho of a hundred different Santa Claus TV specials. Seven million members of the Knights of Columbus (including our own K of C Council 3162) would like to encourage everyone to “Keep Christ in Christmas.” Here are some thoughts on how activities and fun to help you celebrate the true meaning of Christmas with your family. Follow the example of St. Francis of Asssis and setup a Nativity Scene in your home. If you don’t have one, it’s a fun family project to make one! SHADOWBOXES with lights offer the feeling of stained glass. Make a PLAYSET with BLOCKS for the little ones. 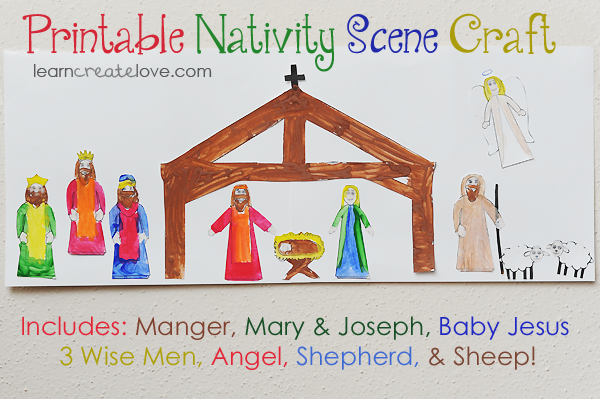 Here is a free PRINTABLE Nativity Scene, just print and cut out. Print and Sing these Christ centered Christmas Carols with your children. Have a birthday party for Jesus, and give gifts to the “Christ Child” that will later gladden the heart of a family in need. Buy some Christ themed Christmas cards that show the Holy Family at Christmas. Our own Knights have beautiful cards or magnets on sale after Masses thru December 15th and 16th. Let your children help address cards to your loved ones. It’s a fun activity, and the proceeds from the Knight’s cardsales help support local seminarians.